Will Vin Gopal Withdraw His Support Of Larry Luttrell For Freeholder? State Senator Vin Gopal last week withdrew his support for Teddy Price, 58, a Democrat candidate for Ocean County Freeholder, ostensibly because of Price’s arrest record for alcohol fueled youthful indiscretions 37 years ago. 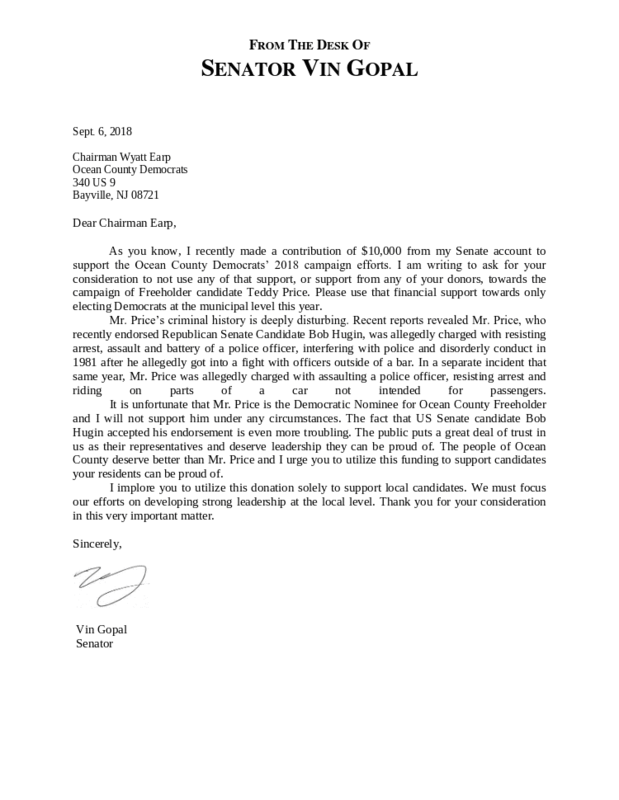 In a conveniently leaked letter to Ocean County Democrat Chairman Wyatt Earp, Senator Gopal asked that the $10,000 donation he made to the Ocean Dem coffers not be used for Price’s freeholder campaign because Price was arrested twice in 1981. The way Gopal tells the story, the charges against Price were pretty serious. “Mr. Price’s criminal history is deeply disturbing,” Gopal wrote. Assault and battery on a police officer, resisting arrest, interfering with and fighting with police were the charges Gopal mentioned in his letter to Earp. Congratulations to NJ Democratic Party Chairman John Currie on his new job as the Public Information Officer of the Passaic County Board of Social Services. And congratulations to the Board on finally finding the right man for the job after an exhaustive 14 year search. Larry ‘The Lunger’ Luttrell , a Democrat lawyer from Holmdel, is running for Monmouth County Freeholder for the third time, according to report at InsiderNJ. Luttrell earned the moniker The Lunger as a freeholder candidate in 2014. During a debate at the Four Seasons Club House in Manalapan, Luttrell jumped from his seat and lunged towards Freeholder Lillian Burry when she asked him, “Is your name Pinocchio?” in response to a comment he made distorting her record. This year maybe we’ll call Luttrell The Masochist because he apparently likes to be beaten. In addition to losing his freeholder race to Burry in 2014, he lost to Serena DiMaso in 2013. He lost a bid to be elected to the Holmdel Township Committee in 2012 and again last year. When we last heard from Lawrence “The Lunger” Luttrell, the three time election loser, was scurrying into obscurity while threatening to sue the Monmouth County Republican Committee for a radio ad that claimed his law license was “suspended” when in fact he had been ruled ineligible to practice law. To our knowledge, no one has actually investigated whether or not Luttrell actually practiced law during his ineligibility. He claimed he was unaware that he had been ruled ineligible, so maybe he did perform legal work when he was not legally authorized to do so. That would be a problem. Now, nearly a year later, Luttrell has resurfaced in an apparent attempt to keep the voters of Marlboro in the dark about Councilwoman Randi Marder’s ethics violations and worse, the waste of $16,000 of Marlboro tax dollars that Mayor Jon Hornik and the Marlboro Township Council authorized to be spent in legal fees to appeal the New Jersey Local Finance Board’s findings that Marder committed eight ethical violations associated with the Township doing business with her husband’s companies. Monmouth County Democratic Freeholder Candidate Lawrence W. Luttrell continued his assault on Freeholder Director Lillian Burry’s character tonight at a candidates forum in Middletown. “There have been 10 indictments since Lillian Burry has been in office,” Luttrell declared at a League of Women Voters moderated debate sponsored by the Lincroft Village Green Association at the Lincroft Elementary School. “Monmouth County has a corruption problem, ” he said. Luttrell rattled off 10 names, starting with former Freeholder Harry Larrison and six other Operation Bid Rig defendants who were arrested in February of 2005. “Those people were gone before I got there,” Burry angrily shot back at Luttrell. Burry was first elected to the Freeholder Board in November of 2005, nine months after the Operation Bid Rig arrests.